The former U.S. Ambassador to Russia during the Obama administration, Michael McFaul, is in Montana to lecture Wednesday, April 10 in Missoula and Thursday, April 11 in Helena. The Montana native is now a Stanford University professor, best-selling author and analyst for NBC News and The Washington Post. He sat down in our studios to talk politics and foreign policy with MTPR's Sally Mauk. Sally Mauk: In your latest book, From Cold War to Hot Peace — which is why you're in Missoula, to talk about that — you basically argue that as long as Vladimir Putin is president, the U.S. is going to be in kind of a stalemate relationship with Russia; that any real political change will only be possible after Putin is no longer in charge. I guess I have two questions. First, won't that be a long time? And second, won't there be other Putins? Michael McFaul: Two great questions. Will it be a long time? Yes, he's in great health. I think he's 66 now maybe 67. But he works out two or three hours a day, and I suspect he'll stay in power for a long time. So that's my answer the first question. The second one is more complicated. It, in many ways, is the fundamental question about thinking about Russia and Russia's relationship with the outside world. And in my academic world there are two main schools of thought. One is that Putin is an individual with a unique set of ideas that moved Russia in a particular trajectory towards greater autocracy and towards greater confrontation with the West. And by the way, I'm deliberately saying the West; it's not just about the United States it's about our allies in Europe as well. I'm in that school. But there's another school of thought that says, no, Putin is just a reflection of Russian culture, Russian history, and he's the expression of things that go back, not just a few years, but hundreds of years. And I used to be very dismissive of that second category, and I've written about it in different ways where I just don't believe in these kind of deterministic arguments, right? I believe that individuals matter, leaders matter. There's agency in the world. But I've become less sure of myself over tim,e because, you know, as Putin is there, you do see continuities not only with the Soviet Union, but going back to the czars. And so I don't know the answer to that question. I have a social science answer that says, no, this was a pivot away. And when people say, 'well the Russians were always this way,' I remind them, well no, actually under Mikhail Gorbachev they were moving towards the West, under Boris Yeltsin — who was the president in Russia after the Soviet Union collapsed — we had very collaborative relations. And by the way, internally things were different too. It was a more open society, markets were more prevalent there — the state now controls more of the economy — a more democratic society. So, there hasn’t been continuity. But was Yeltsin and Gorbachev the aberration? When we look forward 50 years from now, and Putin is the last hurrah of this old tradition, or vice versa; I still don't know the answer to that question. Mauk: In regards to the relationship of President Trump and President Putin, there are two theories of why Trump seems to fawn over Putin. One is that he's beholden to Putin for some nefarious reason, and the other theory is that he's a gullible fool with disturbing affection for autocrats. What's your theory? McFaul: Well, I don't know the answer to the first one. And as somebody who's committed to data and evidence I hope that we all get to read the Muller report and see, you know, to what extent that he tested that hypothesis. I know that he was focused on it. I don't know the answer to that. There's anecdotal things little pieces, you know, the Moscow project, Trump Tower in Moscow. But I think we need to have a fuller picture about that. 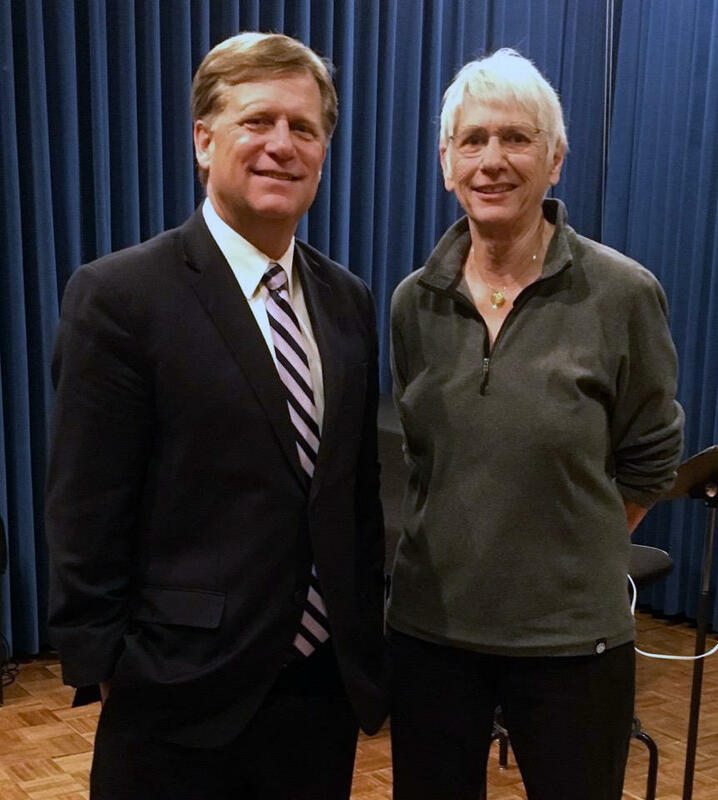 Michael McFaul and Sally Mauk at MTPR studios, April 10, 2019. With respect to the second theory, I lean towards that but with some caveats and nuance. Number one, there's no question that President Trump has a unique affection for President Putin; and I don't know of any other American political leader Democrat or Republican who talks the same way about Vladimir Putin the way he does. That's unique. By the way, there's a giant tension and disconnect between President Trump and the Trump administration, and I've never seen anything like that with any other president. Mauk: John Bolton, for example, is no fan of Putin. McFaul: No, and Secretary Mattis, before he left, and H.R. McMaster, and Secretary Pompeo. You know, the Trump administration, actually I would argue — and they don't like it when I say this — but I think there's a lot of continuity between their policy towards Russia and the Obama administration. It's just that there's one guy in the government that disagrees with it and he happens to be president of the United States. But you asked me the why question. One is, I do think he has this weak spot for autocracies, and so you see it around the world right? Kim Jong Un he talks the same way. McFaul: Erdogan. And that suggests that it's not just some kind of conspiracy or leverage that Putin has, it's just his general orientation. There's another more favorable interpretation which I think we at least have to put on the table, which is that actually, all presidents think that they through the power of their personal diplomacy and personality can break through where the bureaucrats could not. So if you go back in time, we had something called the reset with Russia, the Obama administration. You know, he was sworn in on January 20, 2009 ,and I showed up for work on January 21, 2009, and I worked three years at the White House with him before going to Moscow as ambassador. Now, it was a different time and a different president. That was President Medvedev, but we most certainly used Obama's personal diplomatic capabilities — which are enormous by the way — to help achieve outcomes. And if you go back to President Bush, he also 'looked into his soul' — now I’m going to garble it — but he tried to personally reach out to Putin, too, early in his administration. So, there is something about presidents who think they can do these things on an individual basis. However, the difference between Trump and Obama is, Obama got things done. [If] President Trump through his embrace of Putin, I don't know, got the Russians to leave Ukraine and sign a new arms control agreement, and stop meddling in our elections? I would applaud that strategy. The problem is we have all the, you know, the happy talk about how great Vladimir Putin is, and no results. In fact, I would say the results have been negative as a result of that embrace. And one time it affected me, by the way. When they met in Helsinki for their big summit, their first big summit, the two of them got together and right before then Robert Muller had just indicted a dozen Russian military intelligence officers. And so Putin said, 'oh I've got a dozen Americans I'd like to interrogate.' And I happened to be on that list. And President Trump, because he was trying so hard to connect with Putin on a personal level he said, 'well, that's a great idea.' That was not a great idea for me. McFaul: It was unpleasant, for sure. And it still affects my life to this day. McFaul: Well, I need to worry about when I travel abroad whether the Russians will use Interpol to put out a red notice to try to arrest me. I think that's a very low probability event. I think it's unlikely, but Russia, — Putin's Russia I should say — has a history of abusing the system, Interpol, to go after people for political reasons, not just legal reasons. Mauk: Not to mention poisoning people. Mauk: The contrast between the Obama and Trump administrations has been jarring to say the least, and I think not just Democrats would say that. I think anyone who pays attention to politics would say that. You're obviously a Trump critic, and you're a Democrat, but what's your assessment of this administration's long lasting impact on American politics and society? McFaul: Wow, that's a big hard question. McFaul: Well, the first I want to say is, I'm a Democrat. I'm a proud Democrat, I vote mostly for Democrats. But in my professional domain, national security, the issues don't line up between Democrats and Republicans. I think that's one of the things that's most misunderstood around the world and, you know, in our country. The divides are within the parties, not between the parties. So, one is: Engage with the world or retrench and pull back from the world. Within the Democratic Party, and then within the Republican Party, both of those traditions are alive and well. So, if you go back to 2016, the last presidential election, I would argue that on that dimension, Senator Sanders and President Trump have more in common than Senator Sanders and Secretary Clinton, in that dimension. And likewise, I would say the entire Republican field except for Trump, had more in common with Secretary Clinton. They were all people that wanted to engage with the world. You think about Jeb Bush, way more in common with Secretary Clinton. So just remember that. And then the second thing I would say, you know, national security is almost by definition nonpartisan. Because if we're attacked, if our security is attacked, you know, if the Chinese invade us, or Russia launches nuclear weapons. Guess what, if a nuclear weapon lands on Missoula, they're not going to just kill Democrats and spare the Republicans and vice versa. So, I would like to remind people that in this domain I think we have a National Security Council, not a Republican or Democratic Security Council, because I think they should be talked about that way. That said, and I'm glad you underscored it; I think lots of Republicans would agree with me that President Trump has done damage, in terms of the long term. And the biggest damage for me is two things. One is he's pulled back. He says, 'we're not interested in leading, we're not interested in being part of the world. Maybe we should pull out of NATO.' He says that from time to time. 'Why are we supporting South Korea and the Japanese?' I don't know if he doesn't understand or it's a political statement, I should be careful. But I believe that we are well served by being engaged in the world, being a member of international institutions, so that they can advance our interests. And having allies; like, how is it not good to have allies? So that piece, I think, is damaging and it will take some work to re-engage because, you know, I've been to Asia and Europe just in the last couple of months, and you know, they're beginning to wonder, well maybe America is changing fundamentally and it's not just a Trump issue it's an American issue? Mauk: That's a vacuum that other countries like China would want to fill. McFaul: Absolutely. And they already are, they're filling it, and that's the way international politics work. The second piece that for me personally — this is not of interest to everyone; you know, President Trump doesn't talk about values hardly at all with respect to foreign policy. And I think that's a tragic mistake, because we've made many mistakes in foreign policy, and we are not perfect, and some of them have been really big tragic mistakes, in my view. But we have represented inspiration for what I would call small 'd' democrats around the world in struggling against autocratic regimes. We've lost that role in the world. And, you know, I hope we can regain it, but we've done some big damage there. Mauk: There are people who now say that we are in one of the most perilous times in our history. Do you agree? McFaul: I don't. You know, I'm an optimist. Maybe that's because I'm born and raised in Montana. Has nothing to do with data, but I'm an optimist for two reasons. One, we are a democratic society, we have democratic institutions, and that gives us the possibility for renewal in a way that autocratic societies don't have. And by the way, I see that engagement, civic engagement. I travel a lot because I’ve had this new book out for the last several months. It's been a fantastic way to see the country. And I go to places like Montana, I just don't go to the coasts. And everywhere I go I see people way more engaged on issues of foreign policy than I would imagine. And that gives me hope about democracy and renewal. And number two, you know, as a student of history and as a teacher of history, you know, I would go back and remind people of how dark things looked in the '30s and '40s. This feels a lot better than then when fascism was on the rise and communism was on the rise. Even in the '70s, remember in the '70s the Soviet Union was in the ascendancy, communists were taking over in southeast China and Southern Africa. We had lots of problems here at home in the late '60s, early ‘70s. People wrote, 'oh, the communists are going to take over the world,' back then. So, it is still a challenging time, don't get me wrong. But in a comparative historical period I think we're better off now than those two periods I just described. And two, I take hope in the possibility of renewal. Michael McFaul is a Stanford University professor, author and former U.S. ambassador to Russia. He will be speaking Wednesday, April 10 at 7:30 p.m. at the Wilma theater in Missoula on his latest book From Cold War to Hot Peace: An American Ambassador in Putin's Russia. It's part of the University of Montana's President's Lecture Series. He'll also be speaking at Carroll College in Helena, Thursday, April 11 at 7 p.m. Both events are free and open to the public.